Corrosion Resistance Zinc Plating - Industrial Zinc Electroplating | Gatto Industrial Platers, Inc.
Gatto Industrial Platers has been providing customers with RoHS Compliant Zinc plating for over 40 years. Zinc Plating is a widely available solution for protecting steel parts from corrosion. It is commonly chosen because it is cost effective, offers excellent corrosion protection and features an attractive blueish/silver appearance. 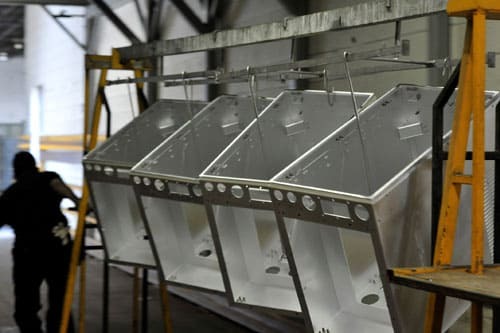 One of the unique properties of zinc plating is that it is a sacrificial coating, meaning it will continue to protect a parts surface even if the coating becomes scratched and bare metal is exposed. Zinc plating is a two- part electrolytic process that utilizes a current of electricity to deposit a thin layer of Zinc onto a parts surface. The zinc layer coats the part acting as a protective barrier against moisture and ultimately corrosion. Typically, once a part has been plated, a chromate conversion coating is applied over the plating to boost the overall performance of the finish by offering protection to the zinc layer. The chromate film prevents white rust formation which is produced when the zinc layer corrodes. Since conversion coatings vary in their corrosion protection abilities, selection of the appropriate chromate or passivate will be influenced by the end use of the part being coated. Two types of conversion coatings are hexavalent and trivalent. Hexavalent chromates, also referred to as dichromates, have been around for decades and up until about 20 years ago were the standard choice among many OEM’s. They offer a superior level of corrosion protection at a low cost. However, usage of hexavalent chromium has steadily decreased due to regulations such as the Reduction of Hazardous Substances Directive (RoHS), which bans hexavalent chromium in products sold to the European Union. Trivalent conversion coatings do not contain hexavalent chromium which makes them RoHS compliant. Their corrosion resistance performance has increased significantly and most OEMs specify them as a replacement for hexavalent chromates. Depending on the surface condition of the part chromate can also provide cosmetic benefits such as giving the part a brighter and more uniform appearance or changing the color of the part. There are various color options available such as Clear (sliver/blue appearance), Yellow, Black and Olive Drab (green). Below is a detailed list of the chromates Gatto can provide along with further information on each finish. We also offer Zinc-Nickel Plating which provides up to 10 times the protection of conventional zinc plating. Improve the corrosion resistance of your parts. Increase the lifetime of the steel. Enhance aesthetic appeal of your parts. At Gatto, our entire zinc plating process is monitored by our experienced technicians to ensure all systems are operating properly and to permit selection of plating thickness, baking, and post treatments. Every RFQ is individually reviewed by our chemical engineer to ensure we are accurately quoting to the correct specifications, and all of our products are inspected and certified to ensure you are receiving the best plating protection at a great price. We also offer local pickup and delivery around the Chicago area. Our fleet of trucks can provide you with pickup and delivery services and our trained drivers pre-inspect all orders at pickup to ensure damage-free transit. Gatto operates both rack and barrel plating lines so we can provide zinc plating for products as small as a 1/16” rivet to as large as a 27-foot fabricated frame. Our King Kong Line allows us to work with parts up to 27 feet in length, 4 feet wide and 8 feet deep. We can work with plating racks carrying up to 8,000 Lbs. Our facility processes 300 tons of material each day with ease. By having the largest plating line in North America, we can help you with any project, large or small. Gatto has the capability to provide industrial metal plating finishes that meet the requirements of general industry standards. The most common standard for zinc plating is ASTM B633, which has four classifications for electroplated zinc. Each classification specifies which supplemental treatment or chromate to apply (Type I,II,III,IV,V, or VI) and the plating thickness according to the type of environment (SC1, SC2, SC3 or SC4). Service Condition 1 is for mild or indoor applications up to service condition 4 which is very severe high abrasion applications. Our processes have been refined over the years to comply with these common standards as well as many other specifications required by most major manufacturers. Please visit our Industry Specifications Page for a detailed list of our capabilities.